Last month, Intel showed off its 80 core chip capable of handling a trillion calculations per second, or one Teraflop. As a brusque reflection of the current status quo in the microchip industry, AMD has now showcased its own Teraflop design. A Flop - or Floating point Operations Per Second - is a term usually applied within a supercomputing context, but AMD says this latest breakthrough shows promise for applications much further down the food chain. 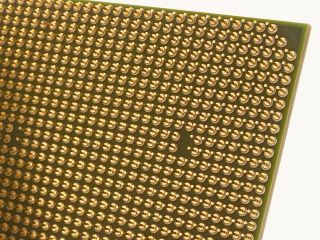 A Teraflop home PC is unlikely anytime soon, but as a proof-of-concept both CPU vendors have shown that the idea is at least possible. Still, it's a long way off. A Teraflop is ten-times the performance of most high-end servers that handle around 100 billion calculations per second. AMD hasn't done everything on a single chip like Intel - instead two dual-core Opteron processors are used. The company says the tech "helps raise the bar...by leveraging sophisticated, massively parallel processors, generally used for 3D graphics applications, to solve real-world problems." The so-called "Teraflop in a Box" system was demonstrated in San Francisco. It runs a standard version of Windows XP Professional. More interestingly, AMD's OpteronT dual-core server chip and two new AMD R600 Stream Processor and Graphics Processor were also showcased. The R600 is AMD/ATI's much-delayed new DirectX 10-capable graphics solution. AMD didn't turn down the opportunity to, once again, pitch the 'New' AMD - a supposed reflection of its acquisition of ATI. "The technology AMD demonstrated today is just one example of how the 'New' AMD is changing the game for our industry," said Dave Orton, executive vice president of visual media business at AMD. "Now that 'Teraflop-in-a-Box' is a reality, AMD can deliver an order of magnitude increase in performance."